CARP BLOG (Mon): how red hot new bait is catching carp! WELCOME to another of our exclusive daily blogs here on the Angler’s Mail website, by Matt Rand on behalf of the guys at Dynamite Baits. RED AMO IS RED HOT! IT has been an exciting time in the Dynamite Baits offices for the last few months now, with the main reason behind this being the overwhelming success of a new bait we will be releasing early in the new year. Our Monster Tiger Nut range of boilies have always been extremely popular with anglers, and as a result have led to the downfall of some truly monstrous carp both at home and abroad. Some time ago now, we were shown a new bait that would also be joining the Monster Tiger Nut. The washed out pink colouration of this bait instantly had us interested, and after crumbling one up the sweet smell of our Monster Tiger Nut could clearly be detected; although this also had a rather fruity tint too it as well. With a few different batches going through the trial and error process, our anglers got too work to see exactly what they thought – I think the results that followed spoke for themselves. Before long the bait was given the name – Monster Tiger Nut ‘Red-Amo’. All of our anglers gave this bait a good go and before long the catch reports started flooding in. Iain Macmillan was first off the mark with a whole rake of fish here in the UK, as well as two fish topping the 60lb mark overseas. We also had John Waller land a near 45lb mirror on his first session with the bait! The list of captures really does go on and on! Perhaps though, the last report we received may have been the most significant – in fact, how often does a UK 50 slip up to a new bait!?! This catch story goes back a couple of weeks, when both Simon and Terry Hofgartner realized that they were onto something with the new bait whilst fishing Chertsey – the home of the big mirror. Terry was first off the mark with a cracking 27lb mirror, but after that capture it was Simon who was to experience one of those red letter periods that many anglers can only dream of. Simons amazing session started with the capture of a fish known as ‘The Simmo’ at a weight of 34lb. A fish on the bank in the cold conditions was a result in itself, but the very next morning he followed it up with another monstrous fish – the venues largest common at a new top weight of 45lb! At this point both Simon and Terry just knew the big’un wasn’t far away, and remaining tight lipped about the previous captures, they waited for their next session on the water, some 10-days later. This soon came round and saw Simon make his way to the same swim as he fished previously. After spreading about 50-60 baits at 80-yards, Simon cast his 15mm ‘Red-Amo’ Pop-Up out over the top and settled down for the long night ahead. Knowing full well that a big fish could be on the cards, Simon opted to use an ACE Razor Point in CXS pattern. With the swim a snaggy one, he wasn’t going to take any chances! He didn’t have to wait too long however, and that night a slight drop back indicated that something had picked up his bait. With the line not even moving, Simon’s first guess was a bream, so he casually lifted the rod, wound down a little, clipped back up and then proceeded to wind in the suspected bream. As the fish drew closer to the net however, it suddenly flat rodded him and powered off, taking about 60 yards of line in the process! Having caught the other bigger fish in the water, Simon instantly knew what he was connected too. Some 30-minutes later and Simon was preparing to net the fish he had come for, a really long and wide brute of a mirror carp. With the fish safe in the net, it was then photographed and weighed in at yet another all time high of 55lb 8oz. A monstrous mirror that was a new PB for Simon and also the first UK ‘50’ taken on the ‘Red-Amo’. This bait, along with a few others will be available early 2014 – we’ll get more information to you within next month’s blog. Another angler who has been enjoying his fishing is Jake Lund. Rather than heading to waters with a known quantity, Jake decided to try a forgotten overgrown pool where the stock was totally unknown. After a week of baiting with 15mm ‘The Crave’ boilies, a quick overnight session produced a stunning – and possibly uncaught – common weighing in at just over 20lb. Jakes fish fell to a 15mm ‘The Crave’ bottom bait fished on an ACE BBP Razor Point. As we’ve always known, even though our boilies are consistent catchers of big carp, many other species can’t resist them either, as Darran Goulder found when he latched into a big river Lea Chub on a 15mm ‘The Crave’ boilie. At 7lb 3oz the fish was a new PB for the former Drennan Cup holder. From everyone here at Dynamite Baits, we hope you have a great Christmas and we wish you all the very best for the New Year. 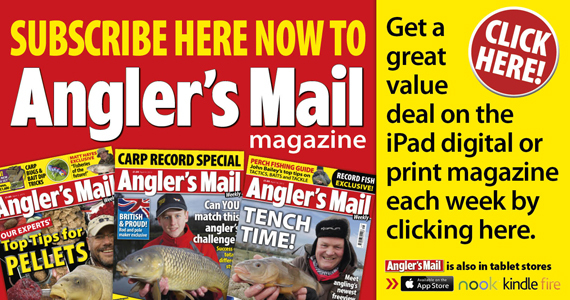 ANGLER’S MAIL’S NEXT BIG CARP BLOG WILL APPEAR NEXT MONDAY.